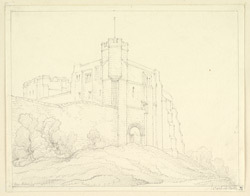 Drawing of a gateway into Carlisle Castle in Cumbria. It is located overlooking the River Eden. This castle was built in order to guard the Scottish border in north west England. The wooden fort founded by William Rufus in the late 11th century, was passed to the Scottish after they captured Carlisle. It remained in Scottish hands from 1135 to 1157. The cube shaped stone keep and curtain wall were then built by Henry II. Over the centuries this castle remained strategically important and and was considerably altered and updated many times, even up to the 16th century.